Everyone knows about the beaches of the Yucutan Peninsula of Mexico: like Cancun, Playa del Carmen and Tulum. But did you know that there are some amazing beaches in Oaxaca state that are just as beautiful, have a similar climate and some of which are a lot less visited by Western tourists? What’s more, the Pacific Coast of Mexico is known by many to be one of the best surf spots in the world. If you’re wanting to try or practice the sport, Oaxaca is the perfect place for you. 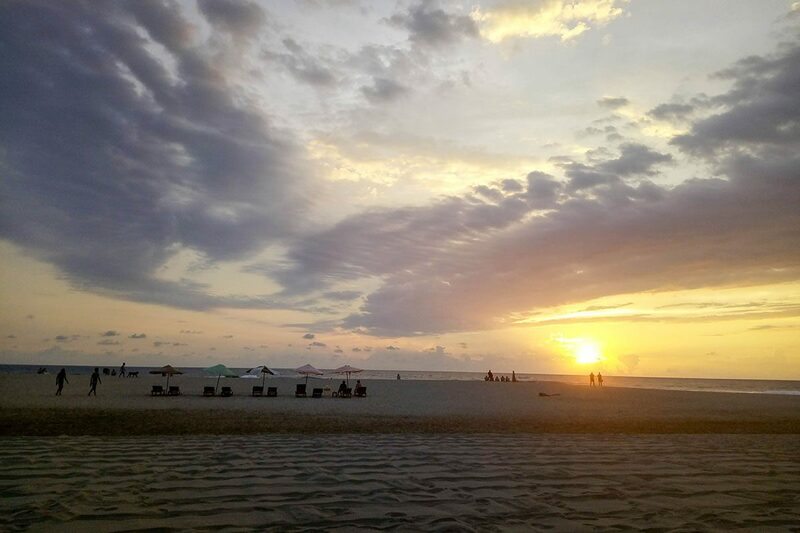 With a few different beaches in Oaxaca, you might be unsure about which is the best option for you. That’s why I’ve written this handy guide to what beach in Oaxaca to opt for. Puerto Escondido is probably the most famous beach town in Oaxaca. It’s popular for its great surfing waves, palm tree lined beaches and relaxed atmosphere. 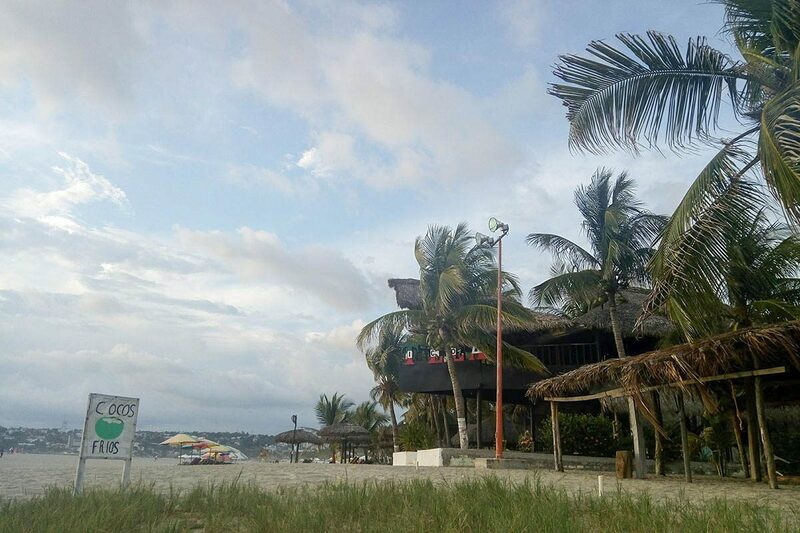 There are plenty of bars and restaurants in Puerto Escondido for all tastes, and there’s something for everyone here. 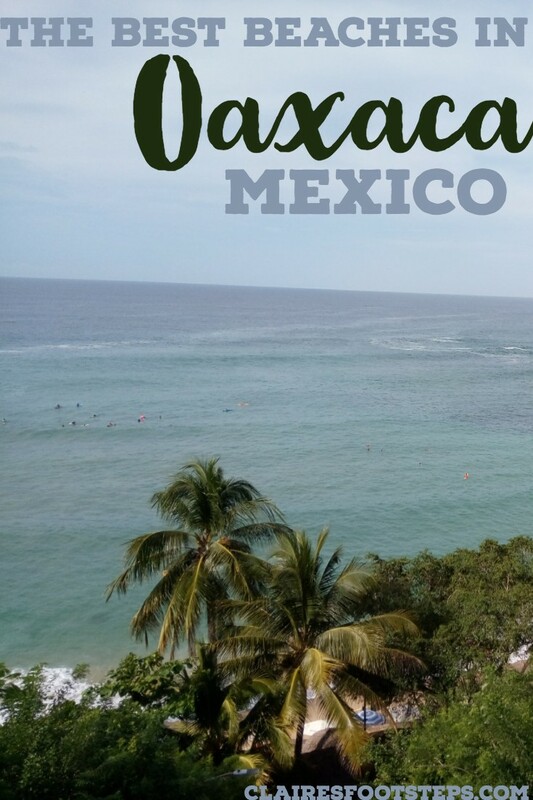 If you’re wondering where to stay in Puerto Escondido, check out my accommodation guide which has recommendations for backpackers, couples, solo travellers, families and groups. 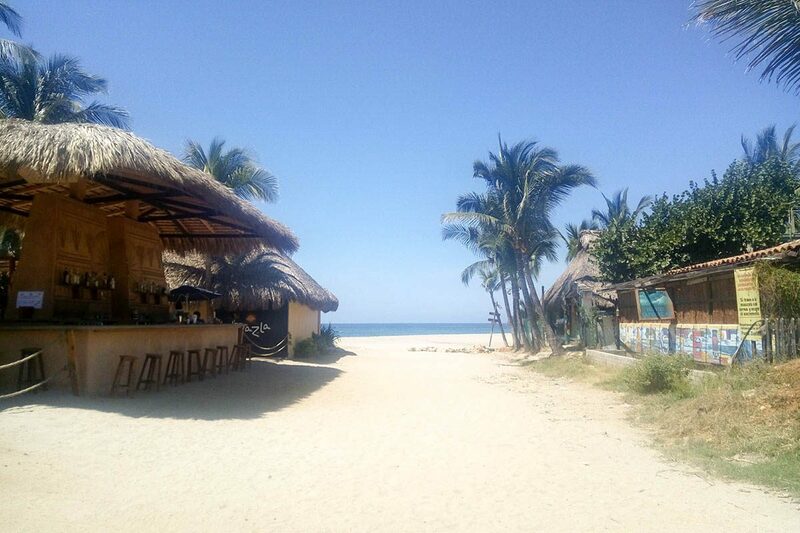 This is the heart of Puerto Escondido, and it’s a great place to enjoy different cuisines, stretch out in the sun, drink one too many cocktails or if you want to go down the hydration route, coconut after coconut. You can’t really swim here as the current is strong – some people who know what they’re doing go to surf, but you have really got to be careful. 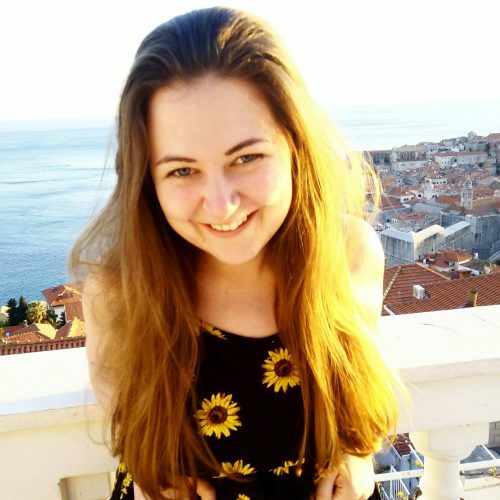 There are lots of accommodation options, from hostels to medium-luxury hotels, and plenty of bars which are open well into the night. After dark, it’s not recommended to walk down the beach (regardless of your gender). Stick to the road that runs alongside it. Holy Moly – all vegan joint which offers a small daily menu and outside seating. Mana del Jardin – restaurant with an extensive vegan menu, including some Asian inspired dishes like a take on the Indonesian nasi goreng. Spirulina – this restaurant has a variety of health foods, including veggie fajitas, a veggie burger, smoothie bowls and some great smoothies and juices. Hotel Santa Fe – Mexican restaurant serving some tasty vegetarian dishes including really fresh guacamole. About a half-hour walk from Playa Zicatela is the quieter, more hipster area of ‘Punta Zicatela’. Known by locals to be ‘what Puerto Escondido used to be’, it’s reminiscent of a super chilled little beach town with small eateries, a relaxed atmosphere and a quiet strip of sand. 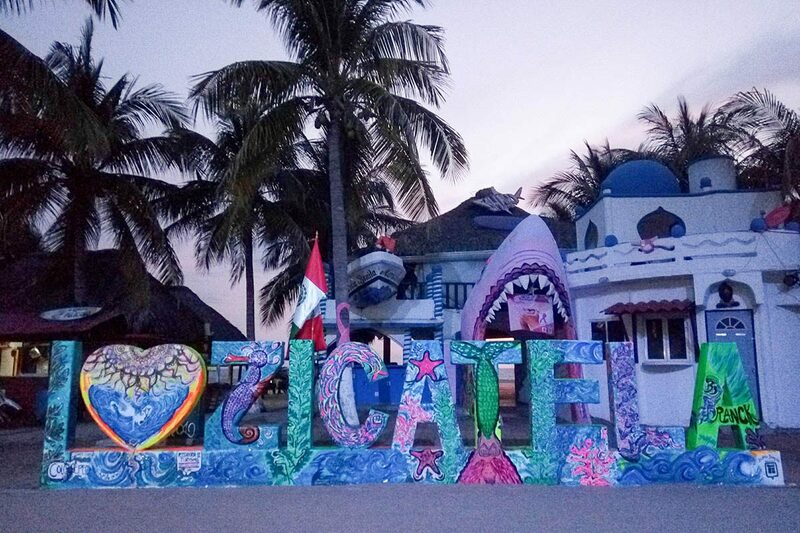 If I was to live in Puerto Escondido, I’d definitely try to stay near Punta Zicatela. It’s full of cute little cafes, shops selling handmade trinkets and of course, sky-high palm trees. The beach is small, but much quieter than the main Zicatela stretch. Take a stroll along the sand, enjoy the feeling of having the beach to yourself, and take lots of photos! Past the city centre is Playa Carrizalillo, a small yet very popular beach. 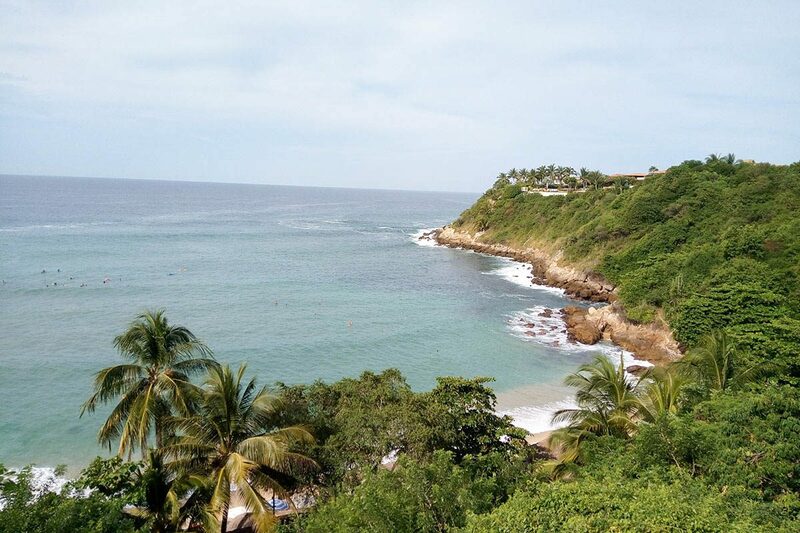 With the blue waters lined by palm trees, many an iconic Puerto Escondido photo is captured looking over Carrizalillo. It’s busy, but essential to visit during your trip to Puerto Escondido. But it’s not just about the epic viewpoint; there are lots of things to enjoy on the sands as well. As the cove is more tucked away, it’s great for beginner surfing. You won’t need to drag a board down here – there are plenty of instructors just waiting to teach for a decent hourly rate. 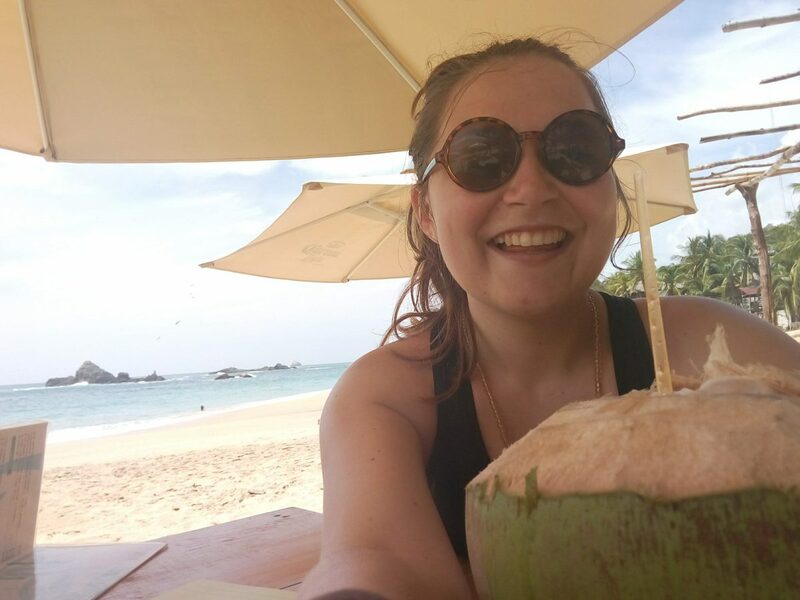 There are also scenic rocks at the end of each beach and bars serving up coconuts and other drinks and snacks. Carrizalillo is a no-straw beach, which I’m fully behind. This means that even the coconuts aren’t served with straws, so don’t forget your reusable straws. Another small bay, Playa Manzanillo is perhaps your best swimming option in Puerto Escondido. It’s a lot quieter than Carrizalillo (I can’t tell you how many times I got those two names confused), but is lovely to enjoy the crashing waves and beautiful golden sands in peace. With the poetic name of ‘little angel beach’, this small bay is better for swimming than the main beaches of Puerto Escondido. It’s a tiny beach, with some steep steps down, a few stands selling food and drink and a strip of sand. Grab a corona or a coconut and chill out here! 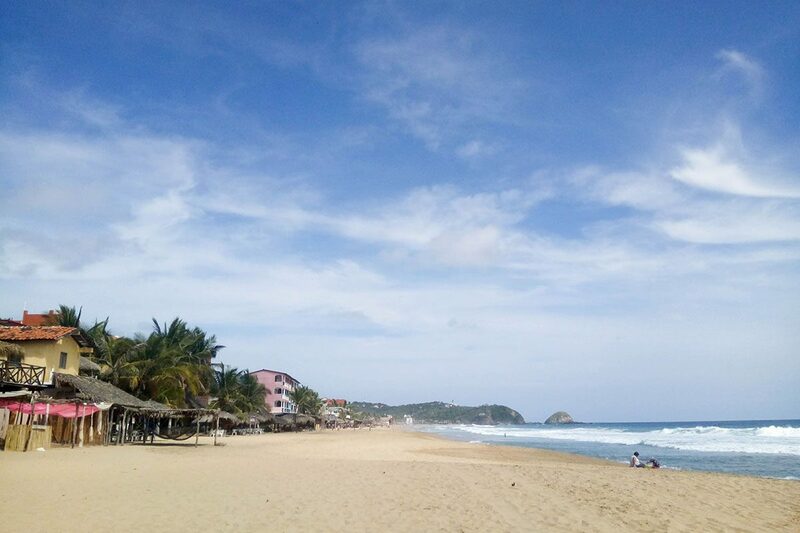 Without a doubt the busiest beach in Puerto Escondido (it is principal, after all), this bay is great to check out for swimming or bodyboarding, meeting locals, or ideal if you just want some sand and sun time in easy access to Puerto Esconidio town. It’s not the prettiest of the beaches in Puerto Escondido, but is still nice – and probably the most convienient. Somewhat of a cross between Playa Principal and Playa Zicatela is Playa Marinero, which conveniently sits between the two. Here, you’ll enjoy spending time with both locals and holidaymakers, and get the chance to dine at lots of different restaurants – as well as sip coconut after coconut, of course. 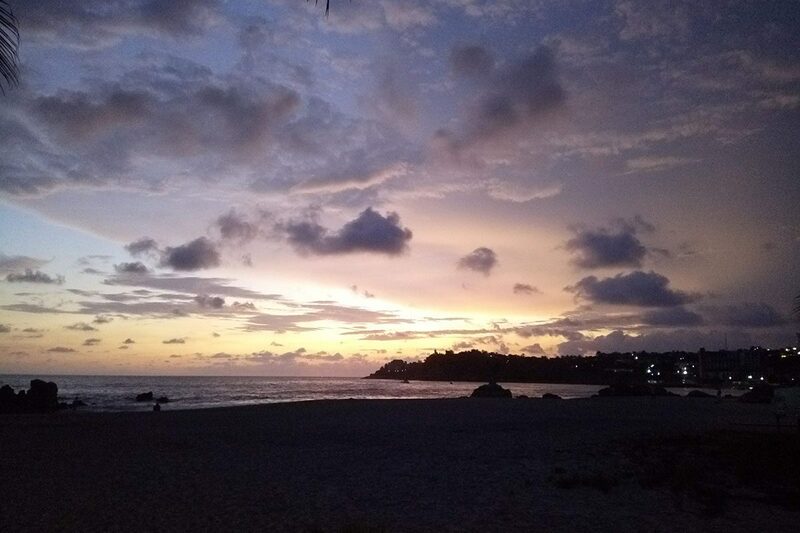 The Puerto Angel area is located around 66 kilometres from Puerto Escondido and is connected Pochulta, which has buses both to Puerto Escondido and Oaxaca City. The closest beach from Puerto Escondido is Mazunte, which is the home of turtles in Mexico. It’s a really small place, with very few tourists. There are a few different restaurants in the town, facilities like a spa and some guesthouses and a hostel. It’s a lovely area and is perfect for those who want to chill out with a stack of books for a week. My favourite eateries in Mazunte were the places along the beachfront. They’re all pretty similar set ups – parasols, coconuts, and fresh food served up while watching the crashing waves. Click here to check out accommodation in Mazunte. Zipotle is just along the coast from Mazunte, and in many ways it is quite similar – it’s small, it’s a space just to unwind and enjoy being by the beach, and the coastline is treacherous. 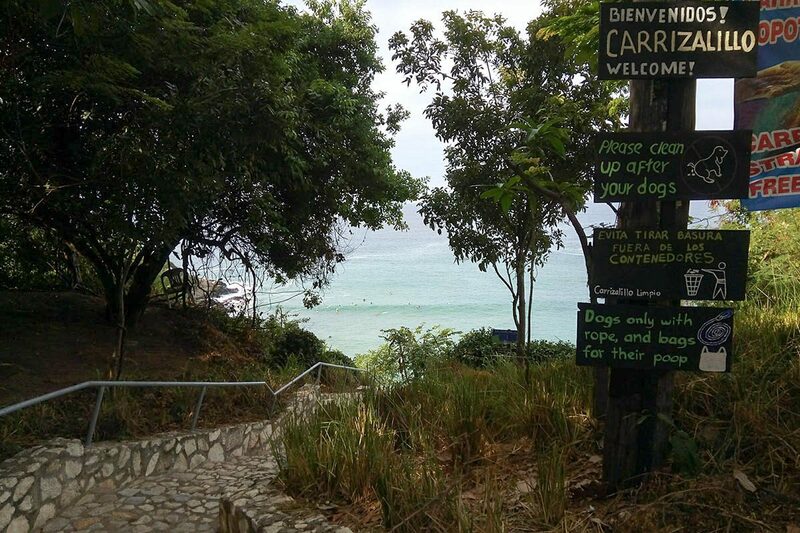 Zipotle does have one thing that Mazunte does not, however – a nudist beach. This beach is right at the end of Zipotle’s main drag, over the rocks. It’s aptly named ‘Playa d’Amor’ or ‘Lovers Beach’. You don’t have to strip off to visit Playa d’Armor, but obviously practice common courtesy. Click here to check out accommodation in Zipotle. Not many people think about spending a beach holiday in Puerto Angel. It’s not a tourist town at all, but that’s why I liked it. It feels much more Mexican than anywhere else, and you really get a sense of how Mexican people use their position by the water. Click here to check out accommodation in Puerto Angel. 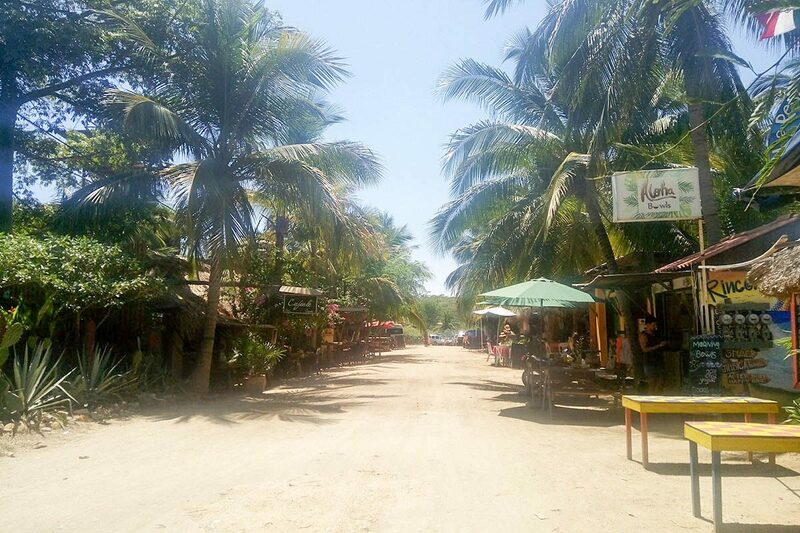 From Puerto Escondido: take a SUR bus from Puerto Escondido to Pochutla and then transferring to a collectivo to the beaches. From Oaxaca City and need to take a bus, you can take one here to Pochutla and then again transfer to a camioneta. If you’re after a resort-y, more all-inclusive type stay, Huatulco is your best bet. Home to a much higher concentration of five-star hotels than Puerto Angel and Puerto Escondido, Huatulco is more about sipping a cold coconut or cocktail from an infinity pool while watching the sun dance over the ocean. And if that’s what you’re on the coast of Mexico for, there’s absolutely nothing wrong with that! But it’s a good place for beach exploration as well. 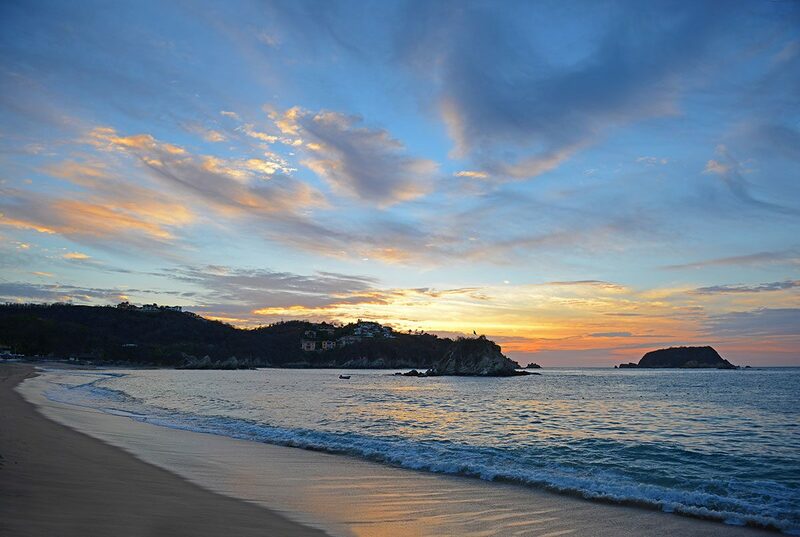 Huatulco has nine bays and 36 beaches, each with its own different character. 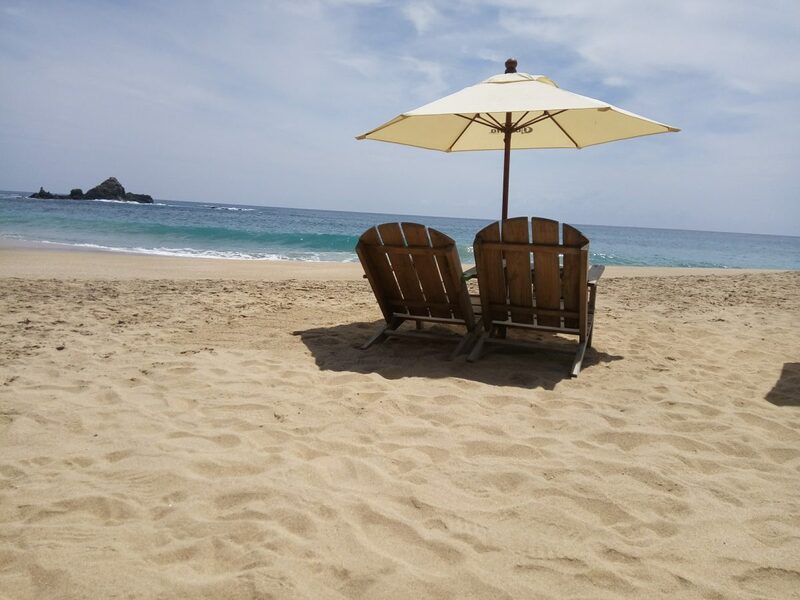 You’ll probably want to spend some time in Huatulco looking around each different bay and taking in their individual characteristics. Tangolunda is where most of the resorts are concentrated, and subsequently the busiest of Huatulco’s bays. You’ll likely stay here. Even though it has lots of resorts, there aren’t really any sky-high complexes and the buildings blend well into the natural environment. Chahué is home to three beaches: Chahué Beach, Tejón Beach and Esperanza Beach. 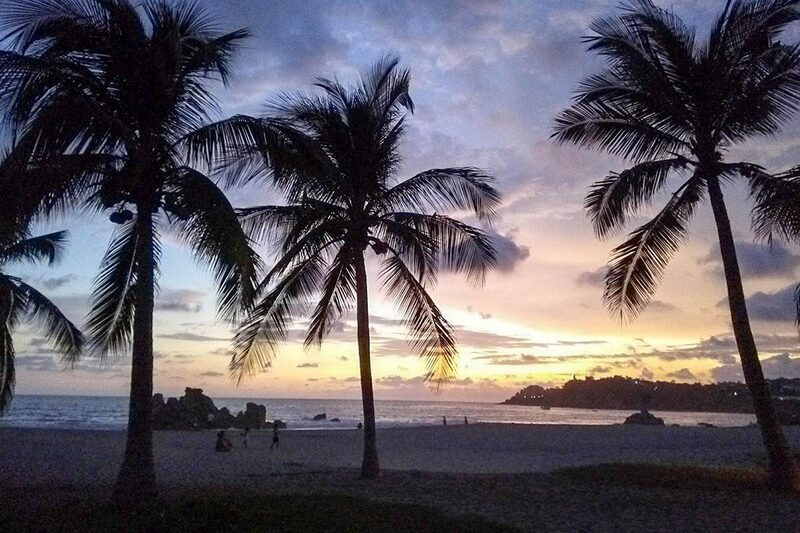 It is one of Huatulco’s more popular beaches, located around a mile from Santa Cruz. While it is popular during the day, it is never too crowded, yet there are popular places to stay and eat here. Santa Cruz has cruise ship ports, shops and restaurants and the beaches have very gentle waves. This makes it another popular area to stay in. 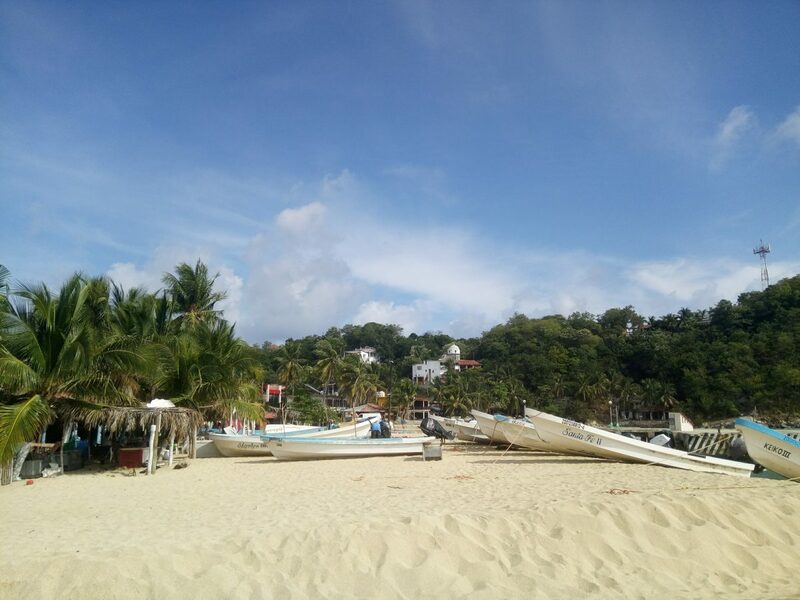 Maguey is one of the more popular bays in Huatulco, with lots of restaurants, bathrooms and watersport activities available. It can be accessed from Santa Cruz by road or boat. 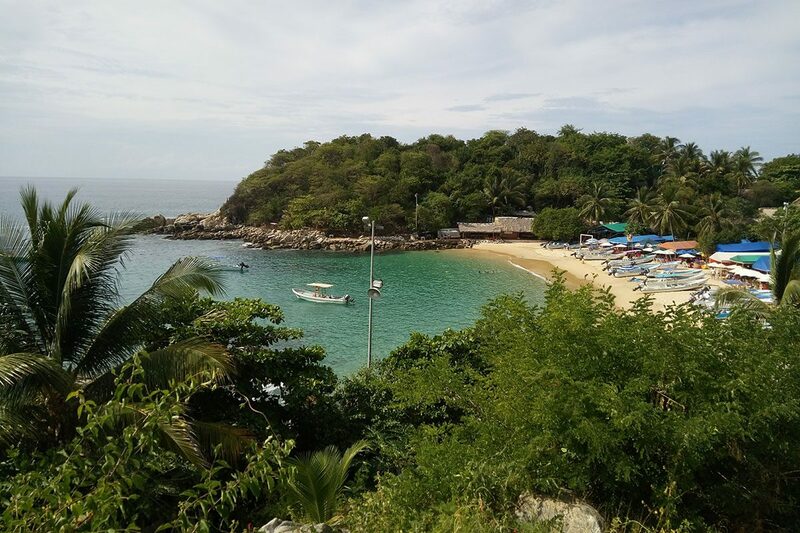 San Agustín is a lot less crowded than other bays in Huatulco, due to the fact that it can only be accessed by a bumpy drive on a dirt track road. Despite this, there are still restaurants, cabañas to stay in and camping facilities. 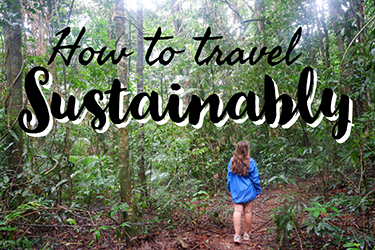 It’s a good option for someone who wants to stay apart from the mass tourism of Tangolunda, but still be able to enjoy restaurants and amenties. Conejos is a good mix between Huatulco’s popular tourist spots and its lesser visited bays. It is popular for snorkelling and there are even some scuba diving companies that operate tours here. The four beaches – Conejos Beach, Tejoncito Beach, Arena Beach and Punto Arena Beach – all have their own atmosphere, and while you won’t be alone on any of them, you’ll likely be able to find a spare spot of sand. Chachacual also only accessible by boat, Chachacual is quiet and home to two beautiful beaches with distinct flora and fauna. It takes about 15 minutes to travel by boat from Santa Cruz. Órgano is located close to Mageuy, but is trickier to get to – the best way is a boat from Santa Cruz. Due to this, it is another secluded, quiet bay that you can enjoy all to yourself! Four of Huatulco’s bays have been designated as ecological preserves where no development is allowed. It is possible to take a tour of Huatulco’s bays to see each one, or you can explore them independently. La Crucecita is not by the beach – it’s actually a short drive inland from Huatulco – but it’s a great spot to enjoy a Mexican town and has lots of shops and restaurants, as well as a pretty church. 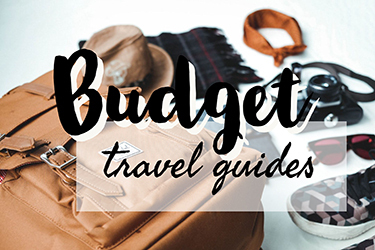 There are more budget-friendly accommodation options here. A super fun eight hour bus connects Oaxaca City and Huatulco. It’s an ADO bus and goes the long way around (around the mountains rather than through them). The ADO buses are a great time, amongst the best long-distance coaches in the world. You’ll have lots of leg room, comfy seats, and they are very safe. Huatulco is also connected to Puerto Escondido by SUR bus. This journey is about 2 and a half hours. For hotels in Huatulco, click here. Ideal for those who want to get off the beaten track, Chacahua is a place to go to escape from the crowds and be… where there’s hardly anyone! 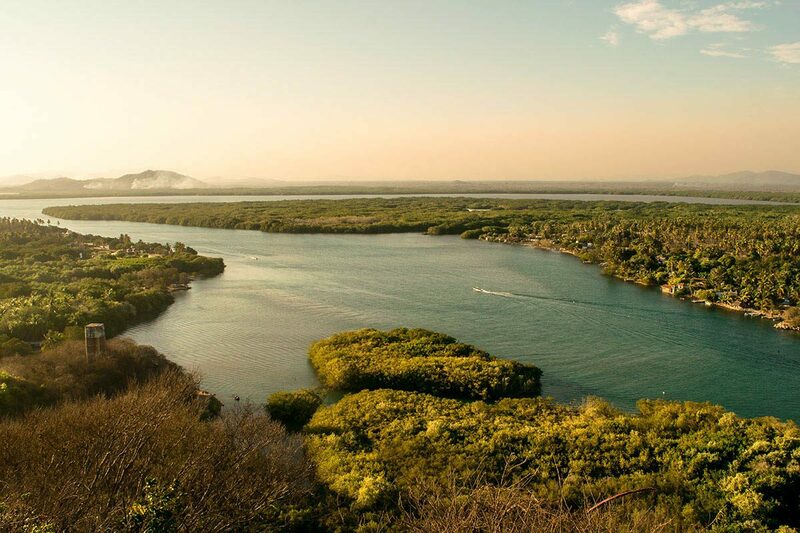 If you like nature, you’ll love Chacahua; with dozens of varieties of birds, turtles and crocodiles (if you know about my crocodile phobia from Australia, you’ll know that I was terrified!). It’s also, like everywhere on the west coast, a fantastic spot for surfing – although make sure that you’ve got experience if you do so. If not, spend days hiking in the national park and exploring the beaches. Take a boat trip through the lagoons and check out Chacahua village. It’s a wonderful place to go to get off the beaten path. Getting to Chacahua is a little more complicated than other beaches in Oaxaca, but it’s certainly an adventure. 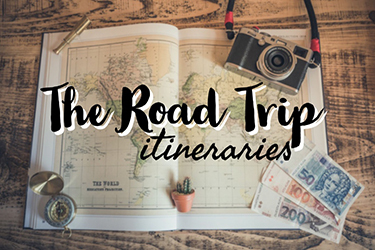 From Puerto Escondido, taxis cost around $60-$70 – ok if you’re travelling in a group, but certainly not economical if you’re travelling solo. The least expensive way is to take a bus from Puerto Escondido to Rio Grande, and from here transfer to a a collectivo taxi to Zapotalito. You can then take a private or collectivo boat to Chacahua, which takes 30-40 minutes and is probably one of the most scenic ways you’ll have ever arrived into anywhere. I hope this guide to Oaxaca beaches helped you out when planning your vacay! You’ll have a blast no matter which one you choose; they’re all swell (pun intended). Hostel: Casa Angel Youth Hostel is a chilled out place with a super social vibe. They offer luxury pod-style dorms, or cheaper basic options. Private rooms are also available. Included is an amazing Mexican breakfast, salsa lessons, a walking tour of the city and survival Spanish classes. Click here to reserve your spot.Mid-Range Hotel: In traditional Oaxaca style, Parador San Agustin is set around a scenic courtyard, in a 16th-century colonial building. You’ll really feel like you’re enjoying authentic Oaxaca when staying here! The hotel has a restaurant and offers breakfast as well as free WiFi. Rooms have large double beds and private bathrooms. Click here to learn more and to book.